Jimmy Kimmel is doing his thing on his show last night, announcing the guest line-up, when a CNN breaking news graphic eclipses the screen. Kimmel is boxed into half a split screen, with the other half occupied by CNN’s Jake Tapper. “Hey Jake, you can do that? You can just fly into someone’s show whenever you want to?” asks Kimmel. “Yes, Jimmy, it’s called breaking news. We’re CNN. That’s how we do it,” Tapper replies. And then Tapper gets down to breaking news business. “Jimmy, we’re getting reports that you’re running for vice president,” he says. “Yes, Jake. That is true. I am running for vice president of the United States of America.” Kimmel says, to audience applause. 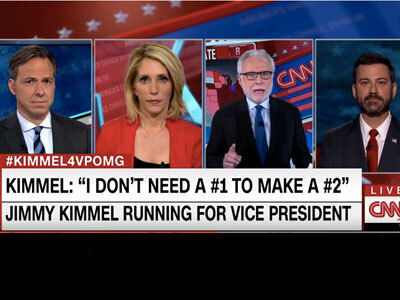 Of course, that scatological turn of phrase earns Kimmel another anchor as Dana Bash joins the two men on screen, the chyron now quoting Kimmel’s 1/2 punch. She asks him to confirm his statement. “You know Jake’s right there. You could ask him yourself,” says Kimmel. “Did he say that?” Bash asks Tapper. After a short bit of stumping, in which Kimmel says he is neither Washington insider nor outsider, the trio turns into a quartet as Wolf Blitzer appears, addressing a collective you and going to the polling data. Of course there’s polling data. And then we get to the truth at the heart of the comedic bit. “Jimmy, do you think you’re making a mockery of this election?” asks Blitzer. “I think it’s too late for anyone to do that, Wolf,” says Blitzer. It’s become almost impossible to do, even when it’s in your job description.